- How do I attack another player or a barbarian? 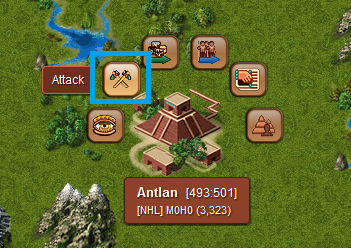 A click on the Attack icon will open up a window with an overview of all units stationed in your city. Select the units you want to attack with. - When launching an attack, who attacks first: the attacker or the defender? The attacker. But the defender will always be able to retaliate. - If I attack someone, will that player be able to see the troops I am attacking with? This depends upon the Espionage level in your city, and the Watchtower level of the defender. In order to be able to hide your troops from the Watchtower of the defender, your Espionage level must be at least 3 levels above the Watchtower level of the defender. 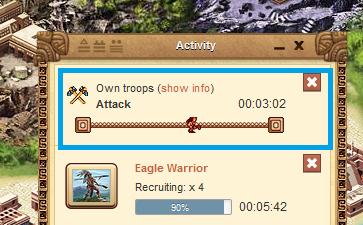 For example, if your Espionage level is 29, a defender with a 26 level Watchtower and below won't be able to see the type and amount of troops you've sent. If, however, the Watchtower level of the defender is 27 or more, they will be able to see this information. 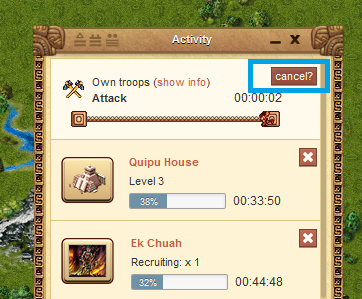 - Can I cancel an attack (espionage/troop transfer, etc.) before it hits the target city? Yes, anytime, as long as the mission in question has not been completed, i.e. as long as the troops have not reached their destination. After you've confirmed the mission cancelation, the troops will return to the city of origin. - How much booty per raid can I take? 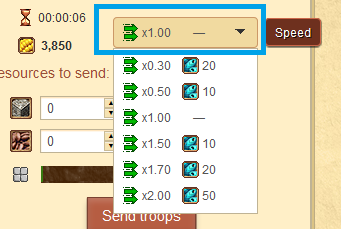 - What can I do to minimize my troop losses? - Build and keep upgrading the Itzamna Temple: the Itzamna Temple is a building where damaged units are healed. Once you have built the Itzamna Temple, you'll be able to heal between 8-15% of your losses. If you don't have this building, you'll lose troops that may potentially be healed. Besides, each level of the Itzamna Temple aids you to save time on healing, since the more advanced the building structure, the less time it takes to heal units. - Send more shamans to the battle: shamans heal damaged units in the course of the battle, which allows more units to survive till the end of the battle (their effect in the battle is defined by the "Regeneration factor"). To obtain the best healing effect of shamans and thus the highest regeneration factor of 30%, you need to send 10 shamans per each combat unit. Note that shamans don't have any influence on the percentage of damaged units that end up in the Itzamna Temple after the battle, as shamans heal damaged units during the battle, not afterwards. 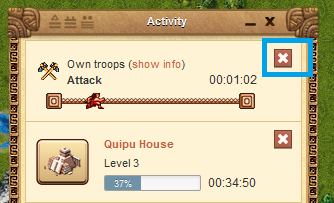 - Send more quipucamayoc to the battle: these units help to increase the total strength of the army, their effect is defined by the "Accuracy factor" that translates into an additional strength bonus. 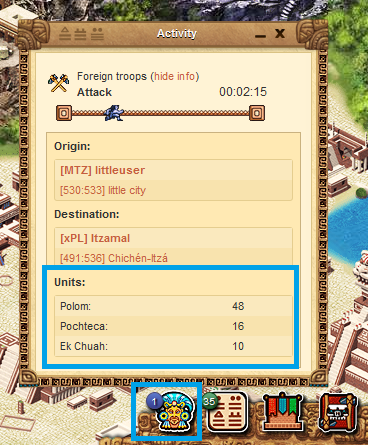 To achieve the best effect of these units (30% of additional strength), you need to send 10 quipucamayocs per each combat unit. - Make use of the strength excess factor: if the total strength (the sum of the strength of all units combined) of a party exceeds the total stamina of the opponent, the party with the exceeding strength will be able to use that exceeding or residual strength to their own advantage, as it will be applied to their own troops (up to 99%). In practice, this factor allows you to reduce your own losses. - Build and keep upgrading the buildings that grant bonuses for your troops: the Temazcal (stamina bonus), the Dwarf Pyramid (strength bonus), and the Stele (luck bonus). - Use the battle simulator: with the help of the battle simulator you can optimize your losses by identifying optimal units combinations for various battle constellations. - Also, there are some premium features such as Ahaw "survival" items, to be found in the Shop in the section "Warfare", that can be used to reduce losses. With the help of these items, more units survive in a battle and can be healed in the Itzamna Temple (between 30% and 100%).